Many years ago now I sat at my nephew’s birthday party and watched him blow out the candles on his cake and smiled. But when they started to cut the cake, I started to walk away. You see, I have something called Celiac Disease which basically means I haven’t had a decent piece of cake in almost 10 years. Kidding :) Well, kind of. It means I can’t have gluten which is what makes cake good, basically :) But my sister called me back into the dining room to grab a piece of cake and I felt my eyebrows knit together. Out of everybody, she was the first and best to get how being gluten-free affected my diet and health. So it was weird that she’d forget that I couldn’t eat that cake. But then my (little at the time) nephew sing-songs that he had his cake made from gluten-free rice cereal so I could share it this year, too. It might seem like such a small thing, but it was a huge gesture to me. Rather than sitting in the living room smiling and chatting with people eating their slices of cake, I also carried my piece around nibbling and gabbing as I went. It was really nice. 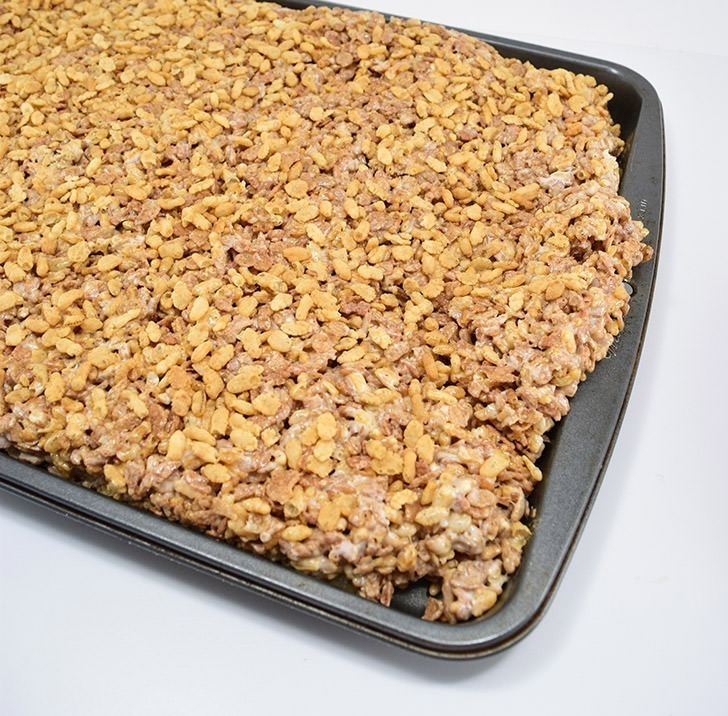 For this project, you’ll need traditional cereal treat bars using your favorite recipe. 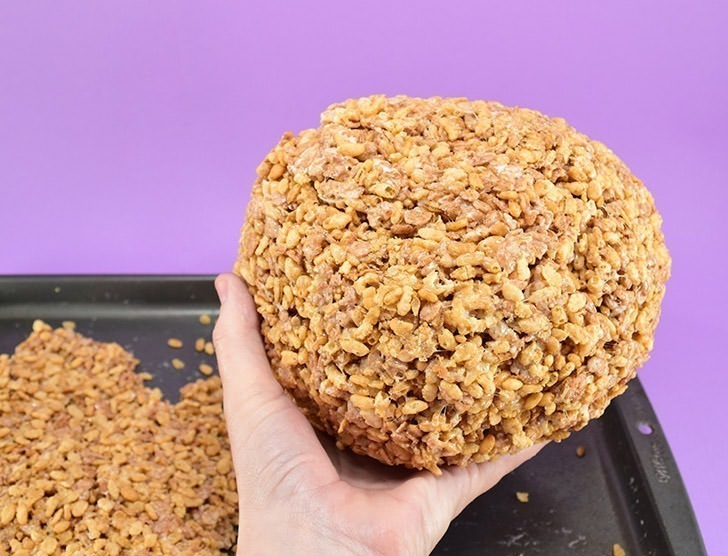 My favorite for building shapes with is approximately 24 ounces of crisp rice cereal (you can blend multiple flavors, as I have) 1 stick of butter and 10 ounces of marshmallows. Melt the butter and marshmallows in the microwave and stir into the cereal in a gigantic bowl (the bigger the bowl the easier it is to stir it!) Spread the cereal mixture on a cookie sheet and allow to cool and set up (I like to do this the night before). 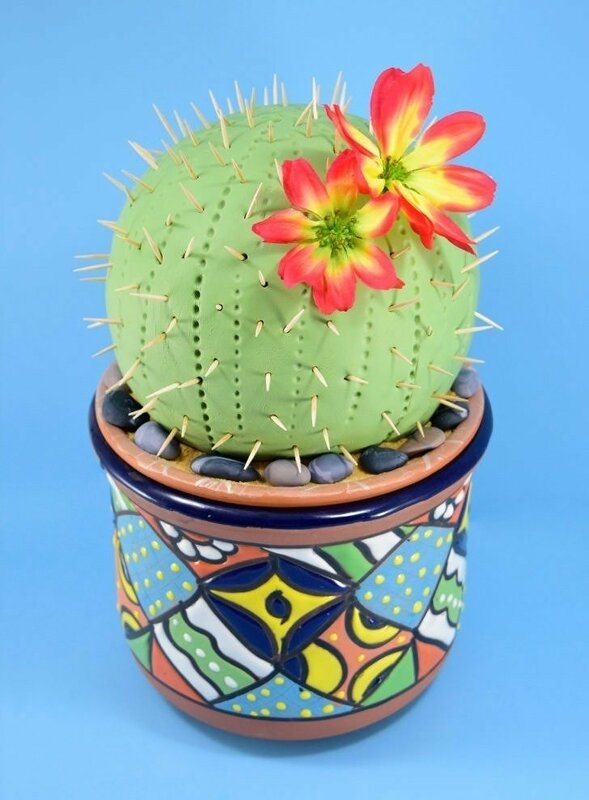 Since we’re making a cactus cake I decided it would be fun for it to be a potted cactus rather than one sitting on top of a cake plate. Fun, right? 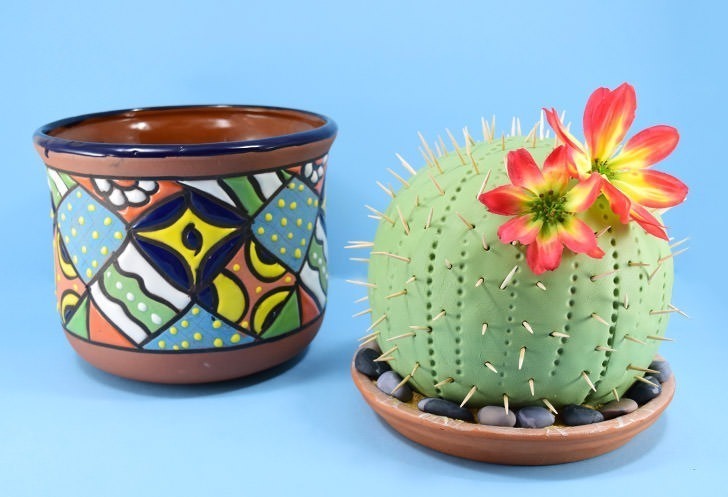 I grabbed a Mexican Talevera pot with an 8″ opening at the top and a bit of a lip plus an 8″ terra cotta tray that you’d typically put beneath a flower pot to catch water. Placing the tray into the pot it makes the perfect cake stand! Now I’m going to go on a limb here and assume that the terra cotta pot that came from the garden section is not food safe. And since I didn’t want to put food straight on top of the pottery I decided to wrap it in self-sticking plastic wrap, like Glad Press and Seal, trimming away the excess, but still maintaining a barrier where the food might be able to come in contact with the clay. 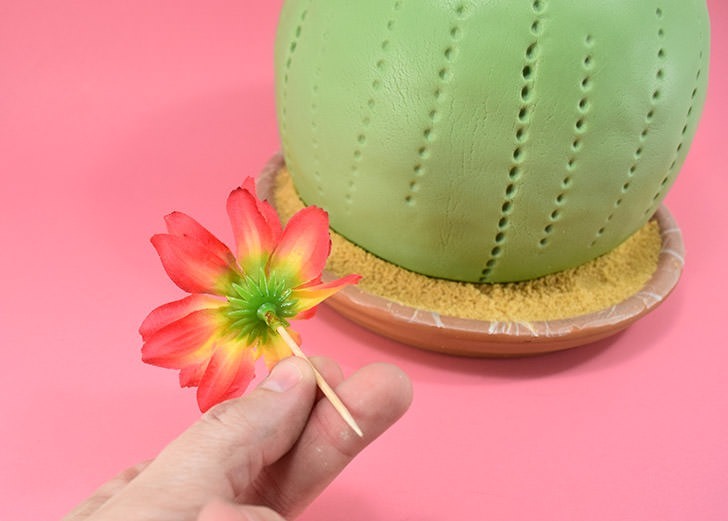 The whole reason that this cactus cake is so easy to make is because we’re going to be using pre-made white fondant as the basis for the decorations. White fondant is good because it can be colored for whatever your need is making it less expensive than buying multiple packages of all of the colors you need. Out of this 5-pound tub, I used about 1/3 of it including the waste I made, which I’m really bad about overdoing it. This was my first experience using Nicole’s Kitchen fondant but not my first experience using pre-made fondant in general. Typically I absolutely detest pre-made fondant because it tastes miserable. Like, why would you put something on a cake that people are just going to peel off because it’s disgusting? 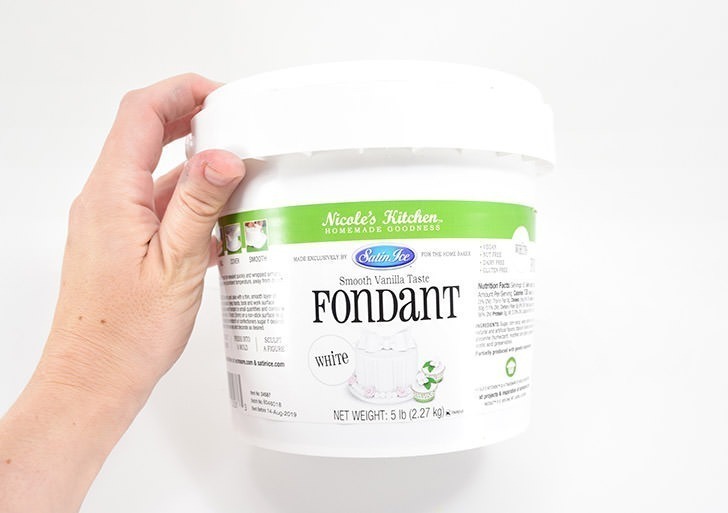 Color me surprised that after opening my bucket up and dishing a bit out I realized that this fondant tastes of vanilla and is really good. Like, seriously. Rob and I have been eating the excess decorations I made for this project like candy. It’s that good. Oh, and it’s also crazy amazing for those of us with food allergies and sensitivities to contend with. Finding a ready-made fondant that will literally state that it is vegan, nut free, dairy free and gluten free is darn near impossible, but A.C. Moore has it and I’m pretty much in love with that. In order for our cake to stand up out of our flower pot we’re going to have to raise it up a bit. Place a round cake board in the bottom of your terra cotta dish so that it fills the entire bottom. Next, cut down 3-4 boards into circles about 1-2 inches smaller in diameter than your first. This is going to be the “stand” that the cake sits atop. To keep these pieces together, use a dab of hot glue in between layers for a quick fix. 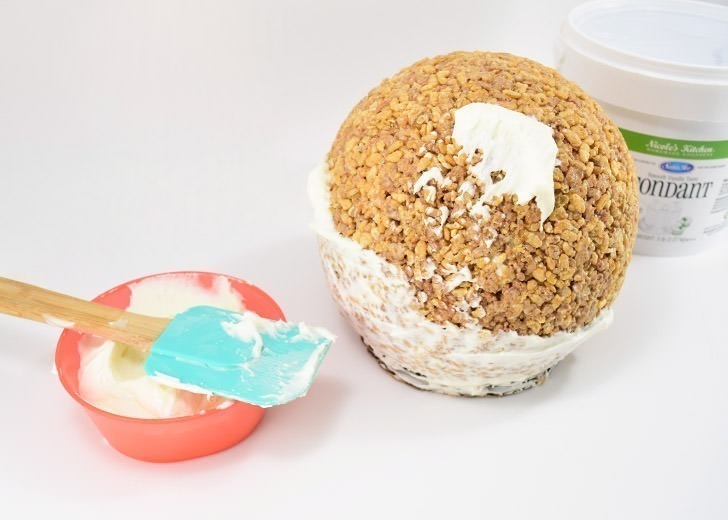 Grab a big wad of your marshmallow cereal treat mix and start to form it into a ball. Add to it until you have used up all of your cereal. 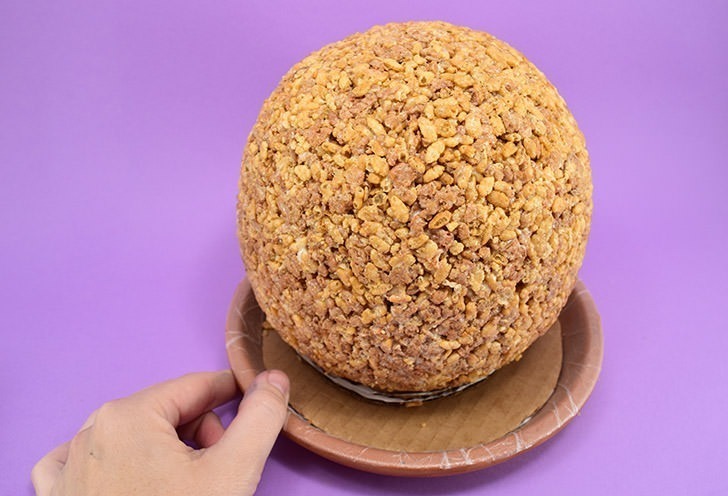 Roll it around on your tabletop to help create nice, round shape. Symmetry is great but I can never achieve a perfectly symmetrical shape and nobody seems to notice, so don’t sweat it too hard. 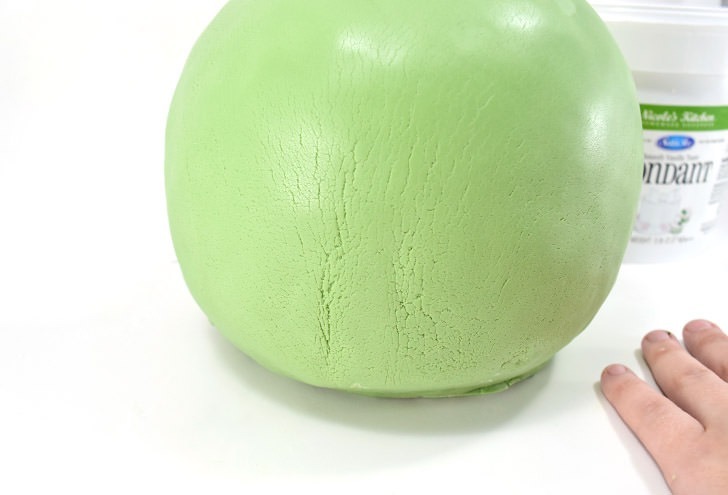 Push the bottom of your sphere onto the table to give it a flat bottom so it’s less likely to roll away from you. Place it on top of your stack of cake boards and make sure you’re happy with the size, shape and placement. 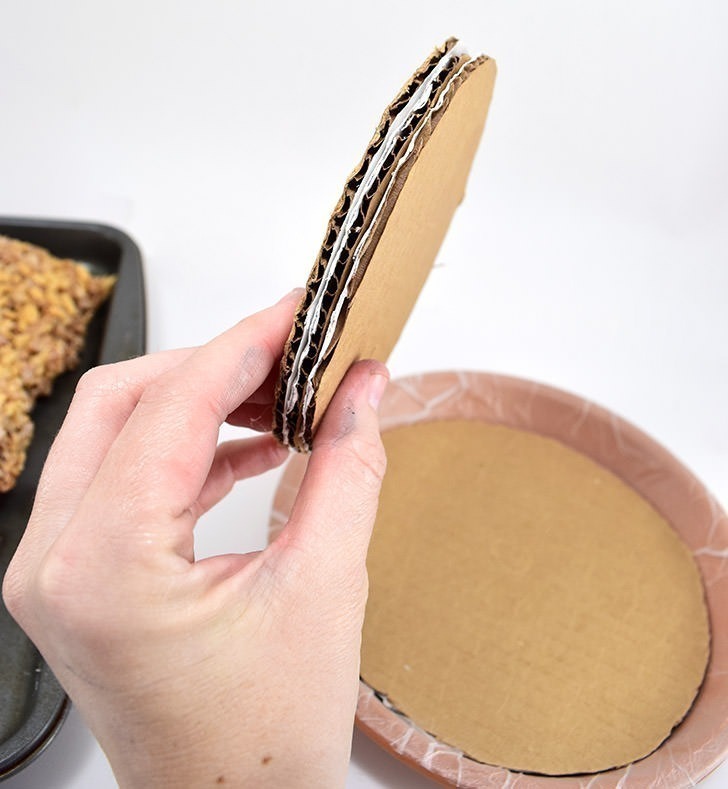 You can always add another piece of cardboard to your tier, here, if it is sitting too low in the clay dish. We need to give our fondant something to grab on to and a way to fill in any weird gaps we might have in the cereal treat shape we made. Take a small amount of buttercream and ice the entire shape, working up from the bottom and smoothing the excess frosting away. If you’re in need of a good recipe, you can use 1 tablespoon of softened butter per 1 cup of powdered sugar and splash of milk, as needed, to give it the correct frosting texture. Once fully frosted set in the refrigerator at least 30 minutes or longer. Working with fondant may seem a bit intimidating but it’s really not so bad. 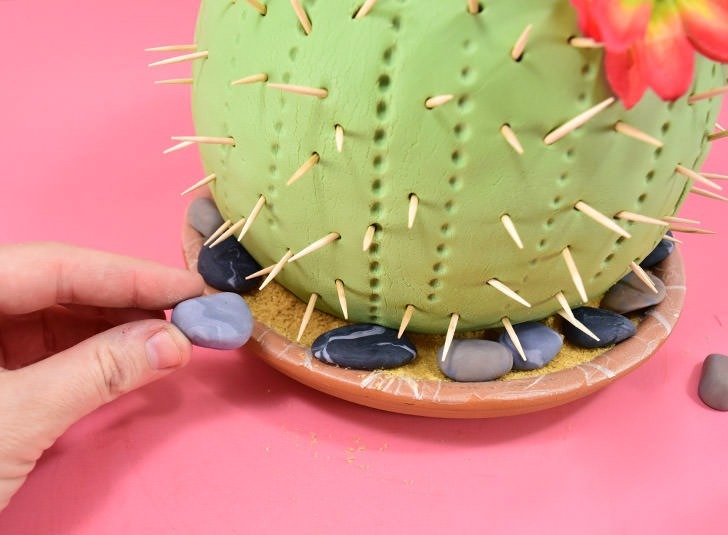 To work our way in, we’re first going to make some candy rocks for decoration around our cactus out of the fondant for a bit of practice. Take a small amount of fondant (about the size of a ping pong ball or 2) and add a very small amount of food coloring to it. In this case, I’m using brown. Begin twisting, turning and kneading the fondant to make it soft enough to work with while mixing in the color at the same time. 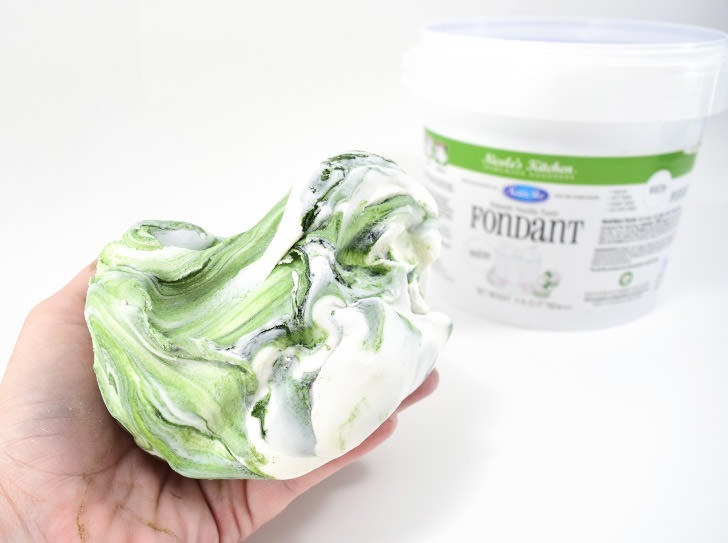 Since we are making rocks, marbling looks nice, so don’t work the fondant until your color is perfectly uniform. In addition to the brown, other colors that will work well for your DIY candy rocks are grey, black and white. Prepare a small amount of several colors to mix and match. 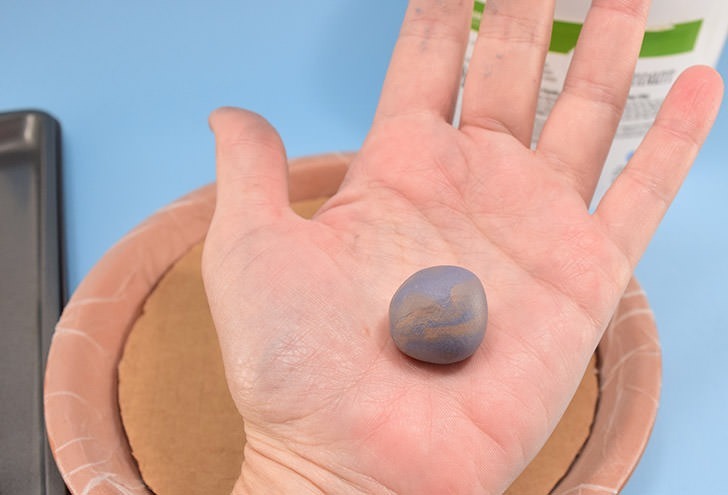 Pinch off a small amount of 2 of your colors of fondant and roll into a ball that is the same approximate size as the pebble/stone you want to make. 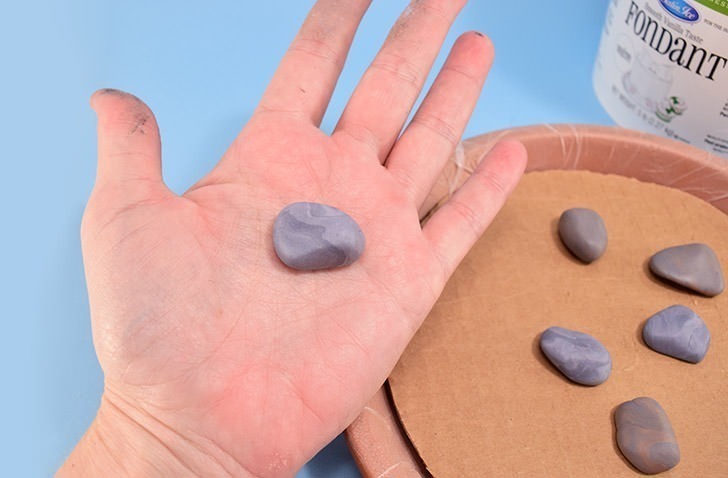 Pinch the extra away if your shape is too large until it’s the right size and roll it back to smooth, again. 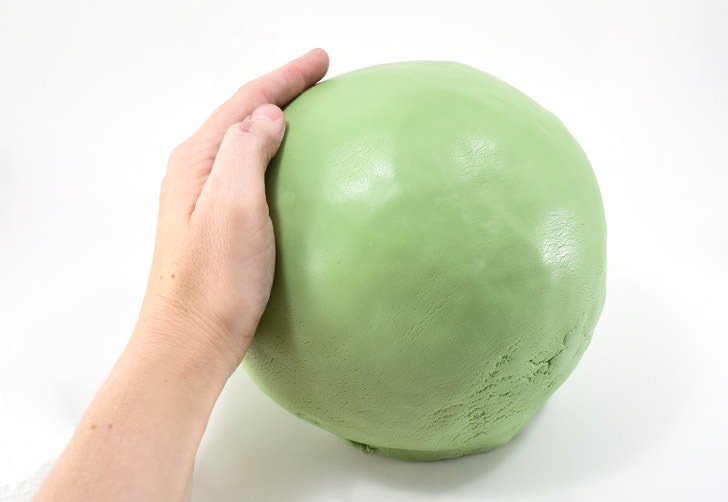 Squeeze the ball to form an asymmetrical, rock-like shape. 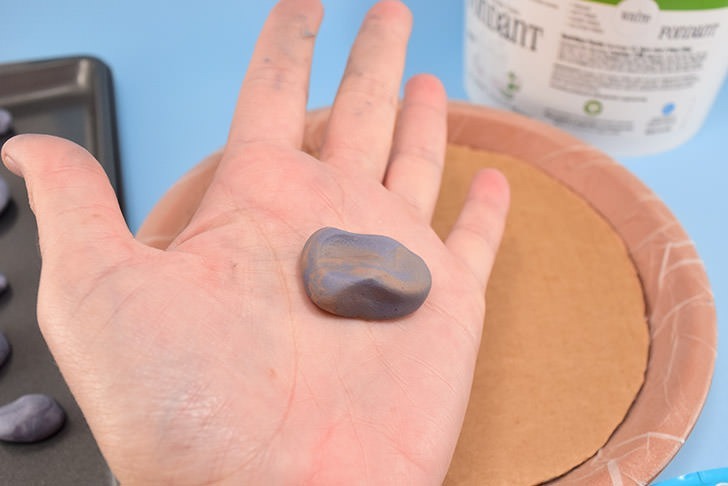 Use your fingers to smooth away any fingerprints in the fondant and place on top of a metal cookie sheet. 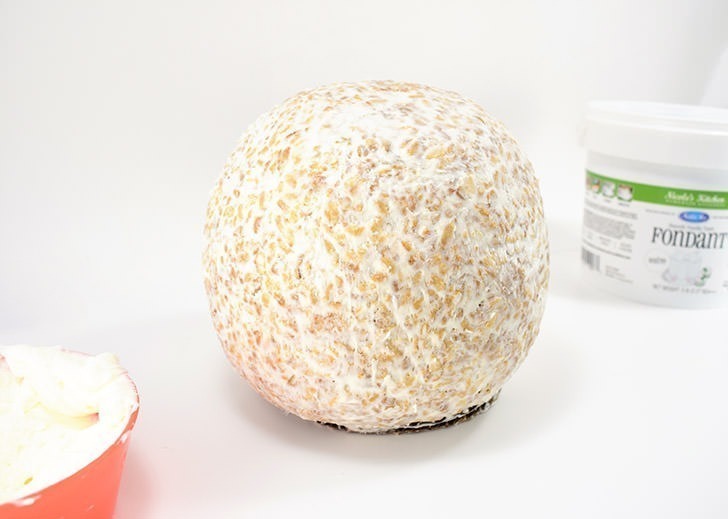 If you don’t have several days to wait for your stones to dry, I’ve got a great quick tip for how to dry fondant quickly… Turn your oven on to its lowest setting (mine is warm) until it finishes pre-heating. Turn it off and allow it to set 20-30 minutes (it’s good to do this right before you start forming the candy stones, FYI). Double check that the oven isn’t too hot (fondant will melt if it is more than just really warm in the oven) and turn the light on inside of your oven to keep the oven warm (it’s amazing how much just the light can heat up the oven!). Place your sheet of stones inside and check after a few minutes to make sure they aren’t melting on you. Leave inside for a few hours, flipping over once or twice as you go, until your fondant rocks have hardened and are nice and dry. 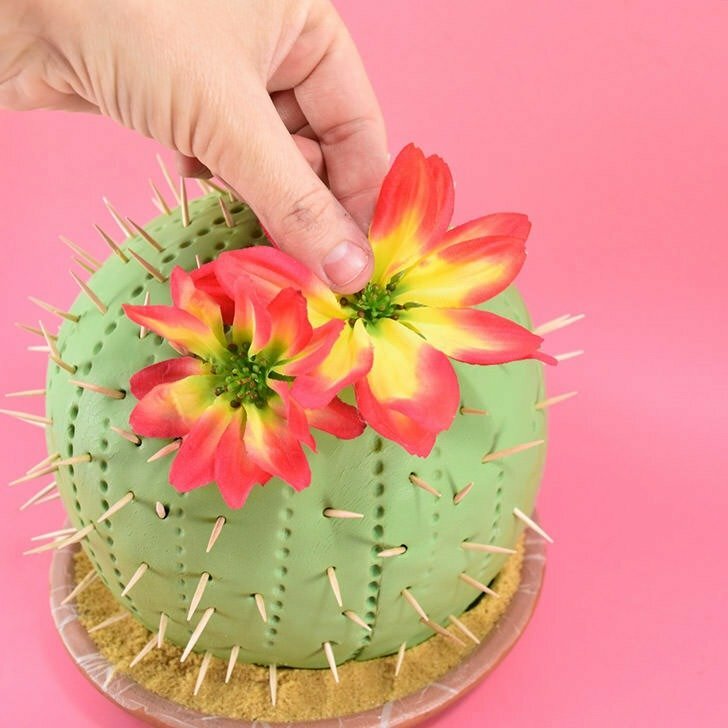 While your rocks are drying out, and after your iced cake has set in the fridge for 30 minutes or longer, we can start to decorate our cactus cake. 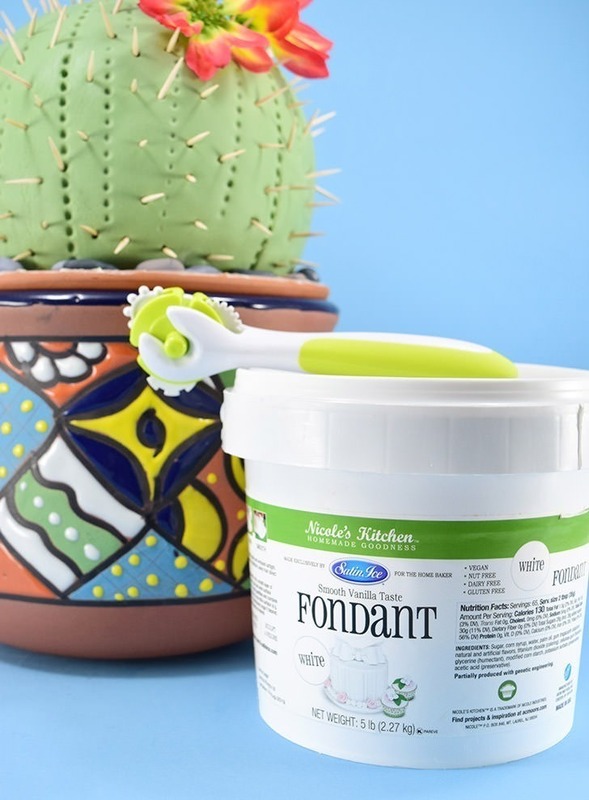 Tint your white fondant green using your favorite cactus-like color. 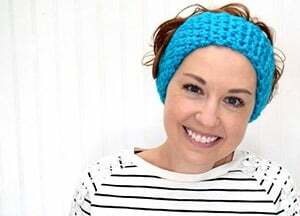 Go easy with the color as you can always add more (but taking it away just doesn’t work!). 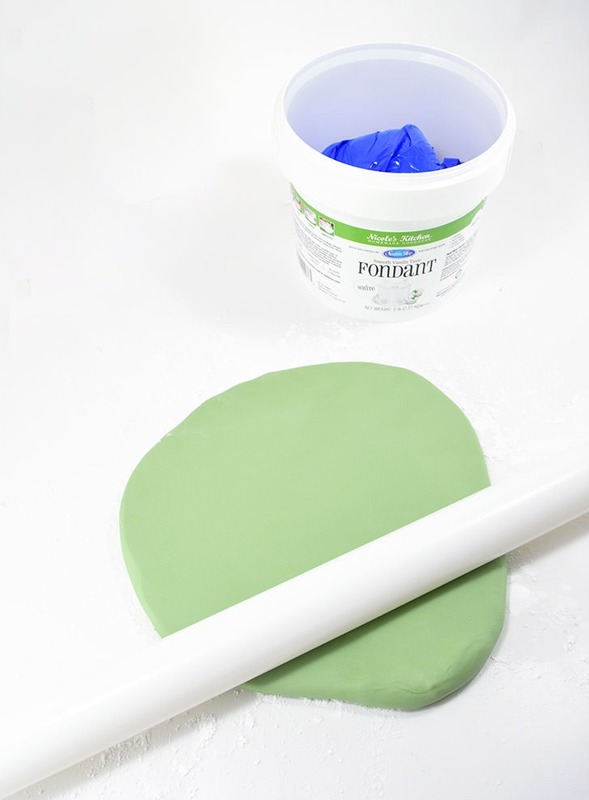 Mix the fondant well until your color is uniform and there is no visible marbling. Roll into a nice, neat ball. 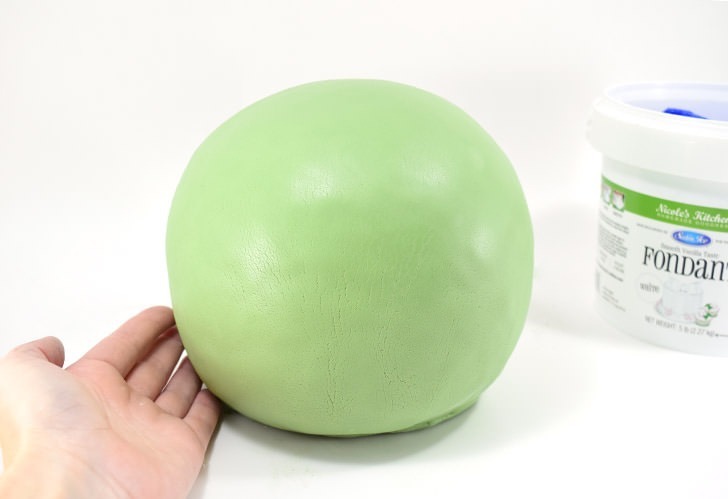 On a very clean, dry surface sprinkled with powdered sugar, place your ball of fondant down and begin to roll it into a 1/8″ (approximate) thick round layer. Pull up the flattened fondant and drape it, powdered sugar side down, on top of the cake. I made the mistake of letting my fondant sit out just a bit too long when I paused to feed my yowling cat to quiet her down. Okay, so maybe I got a little more sidetracked eating hot vanilla fondant rocks off of my cookie sheet while I was in the kitchen, too. When I came back my fondant had dried just enough that when I picked it up it cracked. Darn. But luckily it’s not the end of the world. 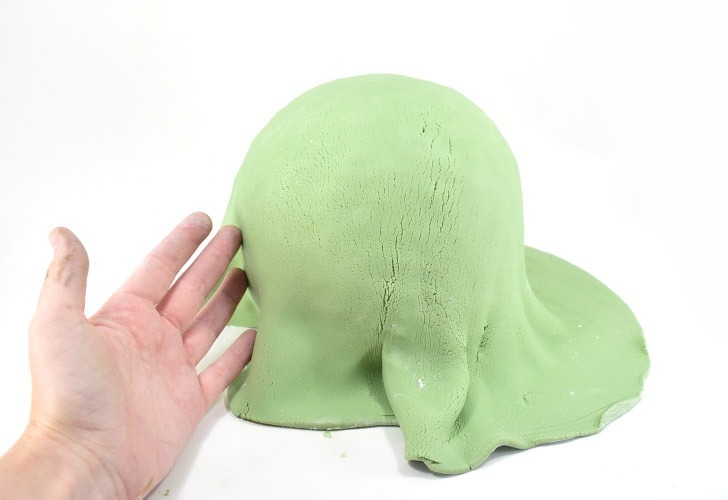 Push the fondant onto the shape, draping and pulling the fondant to prevent as many creases as possible. 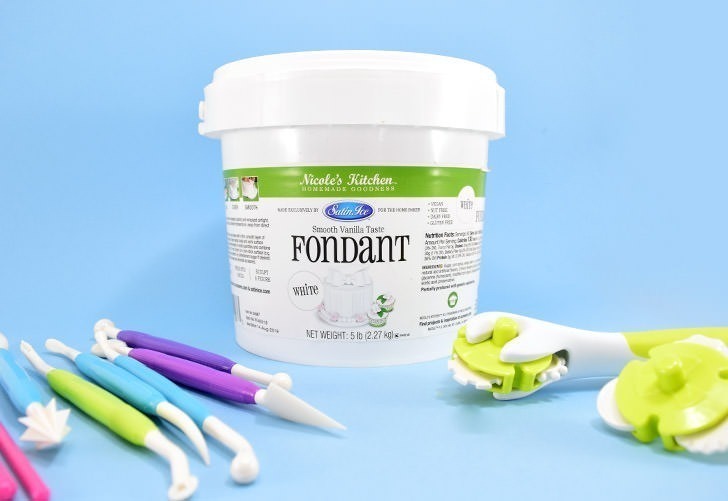 Just because it’s the nature of it, you’re going to have to overlap your fondant here and there, but don’t worry too much since we can smooth the bulk of any issues here in a minute. If you have any terrible looking areas, just make sure they’re on the back :) Work the fondant over the cake and the cake boards “stand” you glued together earlier. Trim away the excess fondant with a knife. Using your hands rub the fondant around like I’d imagine you’d buff a bowling ball, to smooth it out and remove the creases. 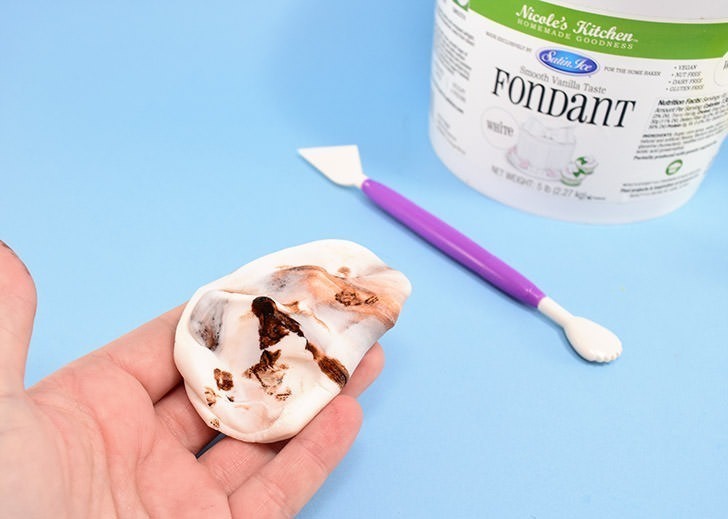 You can also use a fondant smoother, instead of your hands, if you want to get fancy. See? It’s getting better. Since my hands are, like, crazy dry, I will put rub a little bit of coconut oil into the palms of my hands so they neatly glide over the surface. Would you look at that? 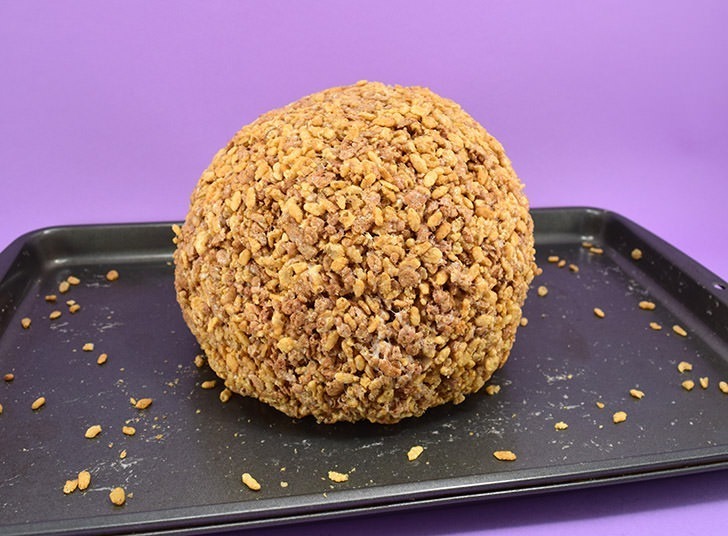 That’s a darn fine looking ball of fondant and cereal treats, is it not? Once you’ve got your basic shape made, it’s time to turn this pumpkin into a carriage… Or a cactus, or whatever. 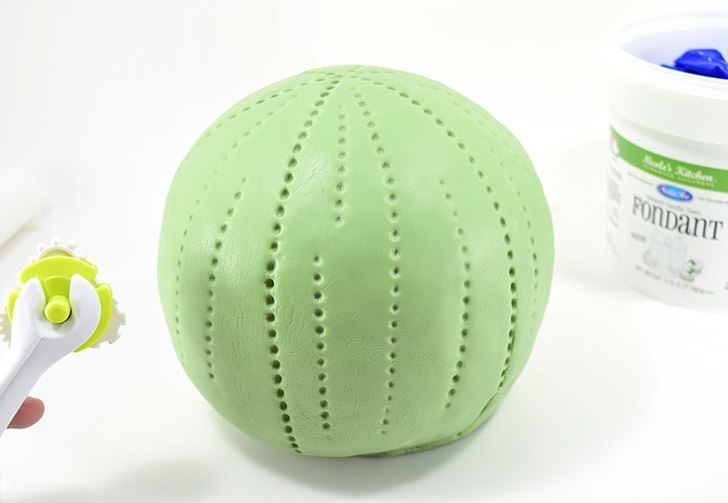 Using a Nicole’s Kitchen fondant embosser, wheel the dotted section around the shape of the sphere from side to side crossing over the top. First make 3 lines going all of the way across like you’re cutting it into wedges, like a pie. Next, run additional vertical lines in each “pie” in a random way. 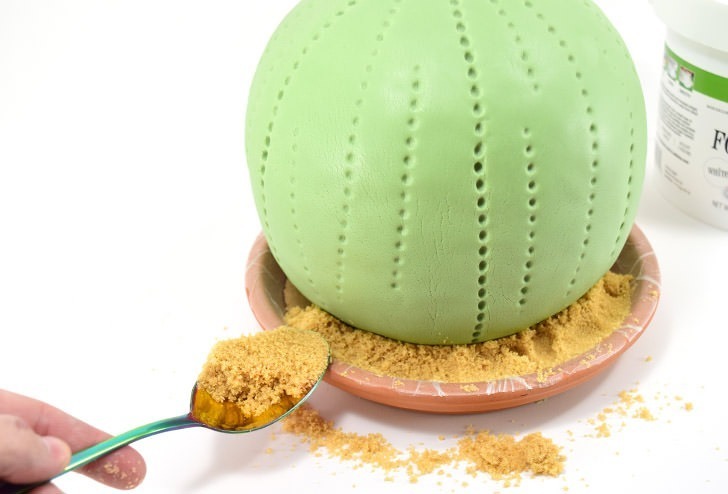 Place your dotted cake into your terra cotta tray and spoon brown sugar around it to look like sand. 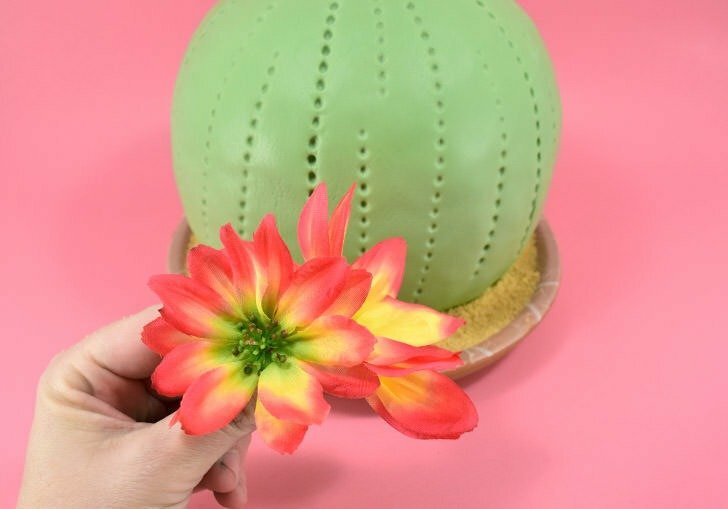 Now you can always make flowers out of fondant to adorn your cake, but that can be a bit more difficult as far as technique goes, so I decided to go through my stash and look for some pretty flowers to use for a quicker fix. 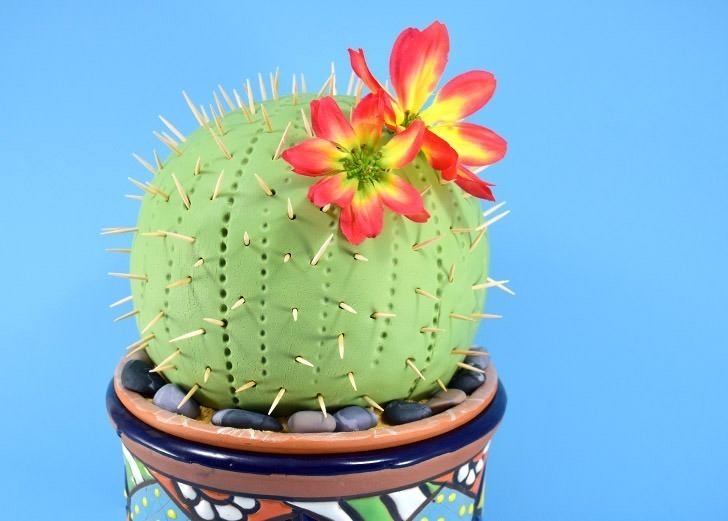 Remove the green wire from your fake flowers and replace with a toothpick. Hot glue and allow the glue time to cool and set. 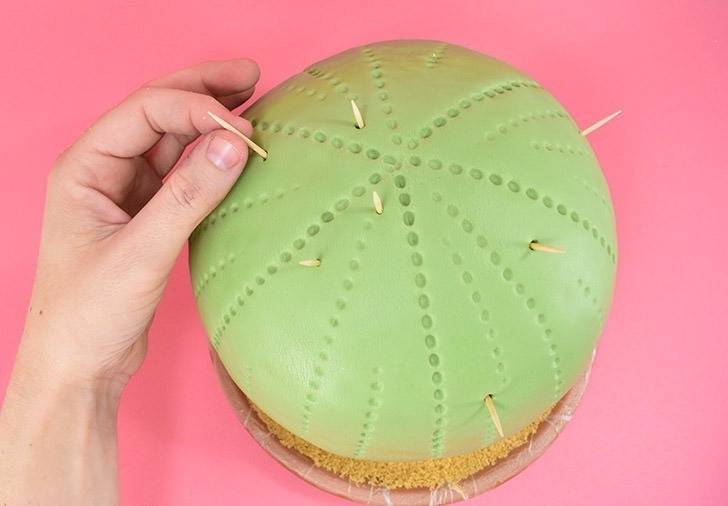 Grab a handful of toothpicks and begin jamming them all around the cake to make it all perfectly cactus prickly. And add your flowers off a bit and to the side or wherever they might look best. Add your candy rocks into the brown sugar “sand” to finish the decorating up. Boom! Now would you look at how pretty that is? 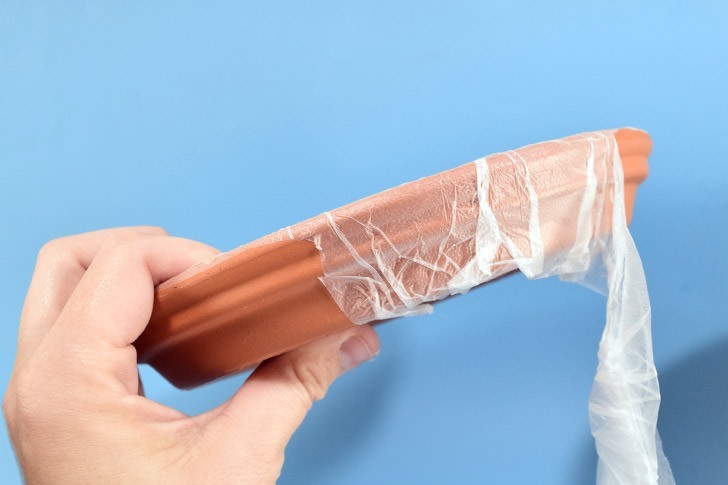 Remember how we covered the terra cotta with plastic wrap? You can totally see it but it’s not too distracting, I don’t think, but you could technically trim more away than I did to make it less visible. 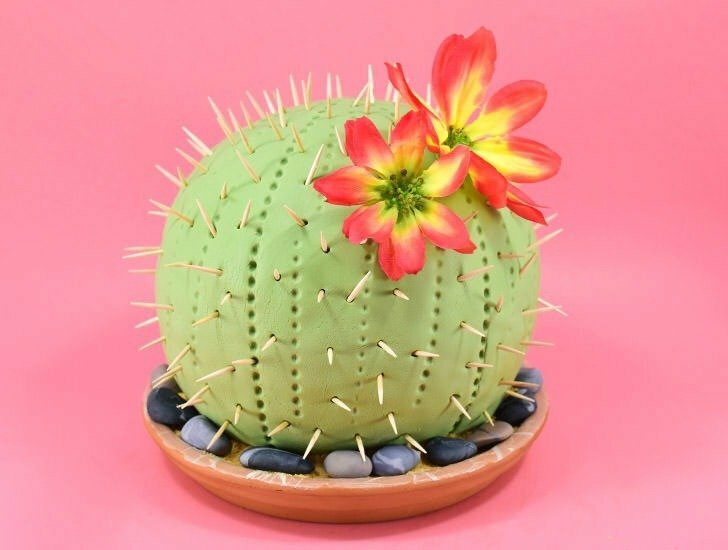 Now the cake looks pretty lovely as-is but I kept wondering where the cactus’ root ball would go in this scenario and it drove me a bit nuts, but you could totally leave it here if you don’t have a pot or just don’t want to mess with it. 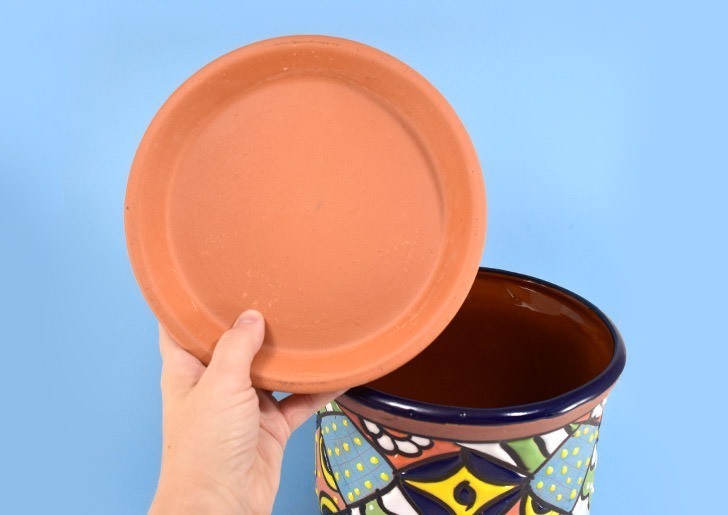 Weigh down your pot just a bit with something heavy inside to help prevent your finished product from being too top heavy and place the terracotta tray into the top of your pot. Double check your decorations after the transfer and fix anything as necessary. 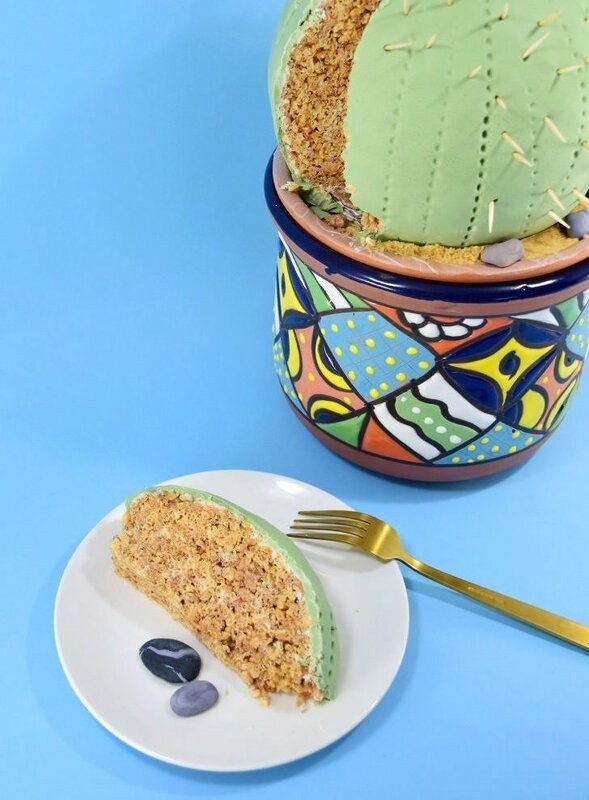 Now that is a fine looking cactus cake, if I do say so myself. And it really wasn’t that difficult at all. That’s the power of fondant, my friends, taking homemade baking up a notch to something amazing! I really do love when something can come together so easily and without an insane amount of specialized skill. After all I’m a jack of all trades but a master of none :) If you’re like me and always looking for your next DIY project, be it another baking or food craft like this one using Nicole’s Kitchen Homemade Goodness, or if you’re looking for something a bit more traditionally crafty, you should totally check out the A.C. Moore Hour with Create and Craft by streaming online via Roku, Apple TV or Fire TV. Or if you’re on DISH Network, you can watch it there. Tune in every Wednesday at 11 a.m. Eastern for inspiration for your next big project!